Last month the spotlight fell on Vilanova Grand Marina, 50km southwest of Barcelona, and once more we’re continuing the Catalunyan theme. This time we’re taking you 50km further down the coastline, direction Valencia, to the uber modern Port Tarraco. Dominated by large glass-fronted buildings reflecting the abundant sunlight, shimmering Mediterranean and UNESCO-protected cityscape in the background, Port Tarraco was initially inaugurated in 2006 but, like many luxury-focussed businesses, became a victim of global recession. In 2011, Qatar’s state-owned property investment firm, Qatari Diar, swooped in to safeguard the marina’s future and purchased it for a sum rumoured to be in the region of 65 million euros. 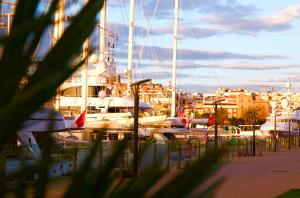 The takeover also made Port Tarraco the de facto Western Mediterranean base for the Emir of Qatar’s yacht fleet. This currently includes Lürssen-built Katara which at 124 metres ranks amongst the world’s top 20 largest superyachts – with its helipad atop and chic underwater lighting it’ll certainly add a touch of glamour to the Costa Daurada. You certainly get a sense that Port Tarraco is now in very safe hands. Qatari Diar is controlled by the Qatar Investment Authority, the sovereign wealth fund of the State of Qatar, which itself has 335 billion USD assets under management. These assets include Harrods in Knightsbridge, Italian fashion house Valentino, East Village (the Olympic Village) in London, Paris Saint-Germain FC, 95% of 95-storey The Shard in London and almost 26% of J Sainsbury plc. Closer to home, the state-owned flag carrier, Qatar Airways, is proud sponsor of FC Barcelona. So what magic have the mighty Middle Easterns injected into Spain’s Port Tarraco? A quick Google and it’s clear that the answer is ‘a lot’. 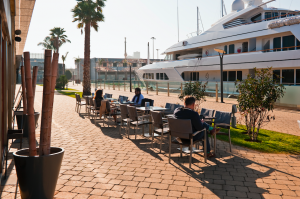 The marina is blossoming into the social hub of coastal Tarragona. Eight or more brand new retail units have opened (or will open) during the course of the last few months including a leather goods store, insurance agency, geolocation solution company Movertis, wakeboard surfboard and snowboard manufacturers Rio Longboards, perfume cosmetic and accessory store MaxDream, a pizzeria, ice cream parlour, and a chill out Beach Club Restaurant next to the marina’s emblematic amphitheatre. 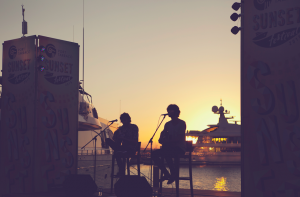 They join existing restaurants, bars and nautical-related business to help generate a great deal of footfall and a bustling vibe for the marina. 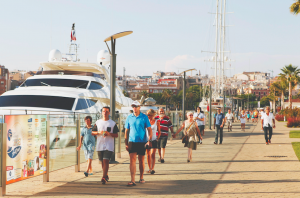 Port Tarraco’s General Manager, Marc Colls, advises that with the arrival of these new businesses, office occupancy levels will reach 100% and retail premises almost 80%. “We took over management in 2011 when the general economic situation was very different. At this time businesses were closing, but we can say that since 2015 things are very different,” Marc said. His objective is to achieve “practically full occupancy” before the end of the year. The team has also made the marina more accessible to the public, removed any barriers to entry, planted plenty of trees and shrubs, and installed pathways and chic illumination as well as a brightly-coloured playground for little ones. 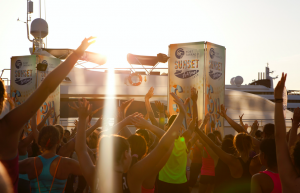 Meanwhile, the summer months play host to the Port Tarraco Sunset Festival where live music, performing arts, big screen films, and sport converge onto the purpose-built amphitheatre around sunset – naturally. But what about the star attraction – the moorings? Catalunya hasn’t been particularly well equipped for superyachts. Reports say there are almost 33,000 moorings in the region but two out of three are for boats less than eight metres in length. Only 9% accommodate boats over 12 metres and even fewer for superyachts (defined as being over 25 metres in length). 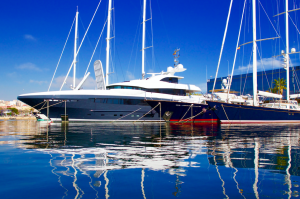 With Superyacht Intelligence claiming there are 6,184 (or more) boats above 30 metres in the world and El País reporting that 80% of the expense of a superyacht (around 890,000 euros per year) remains in the home port – it’s a trick that Catalunya really doesn’t want to miss. 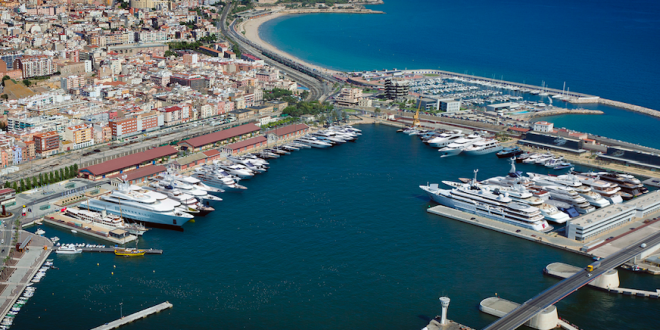 Port Tarraco stands head and shoulders above the competition in terms of plugging this gap and, thanks to enlargements and improvements overseen by the ‘new’ Qatari ownership, now boasts 64 deep-water berths for boats ranging in size from 30 metres to 160 metres (yes – it’s ‘super’ ‘mega’ and ‘giga’ yachts only) with a 140 metre waiting quay. In fact it is one of very few Med ports (perhaps the first?) that can simultaneously moor more than half a dozen boats over 100 metres in length. The marina embraces the latest in technology, quality and security levels for its VIP visitors, alongside a bespoke concierge service which ensures every crew has a warm welcome and a smooth stay. International Ship and Port Facility Security (ISPS) Code compliance, in-berth black and grey water discharge, waste collection and MARPOL (Marine Pollution) certificate, internet and satellite TV, CCTV and 24 hour surveillance, on-site storage rooms and a fitness club are just some of what Port Tarraco has to offer. Slick transport links (7km from Reus Airport – ideal for private and commercial flights, 90km from Barcelona Airport – Spain’s second busiest, direct motorway connections to the rest of Europe, and 15 minutes from the high-speed AVE station which connects Tarragona to Madrid in under two and half hours) plus access to all of the Western Mediterranean’s best cruising grounds (Côte d’Azur, the Balearics…) add further to Port Tarraco’s appeal. Port Tarraco’s ‘big boat’ strategy is most definitely working. Since 2011, 15 of the 38 largest yachts in the world have spent time at anchor in Port Tarraco – undoubtedly taking time to explore the gorgeous surroundings in the process. Right on the doorstep, the city of Tarragona, with its vast Roman remains, walls, and fortifications set alongside medieval Christian monuments, has been part-protected by UNESCO since the year 2000 and offers a wonderful juxtaposition of ancient and modern. Wander a little further and Spain’s ‘Golden Coast’ is blessed with scores of sandy beaches, unspoilt national parks, mountains suited to hiking, horse riding and skiing, the wide Ebro River – a kayaking paradise, famous vineyards, signature golf courses and renowned theme and water parks. The beautiful warm Catalunyan climate ensures the great outdoors is ‘open’ all year for everyone to enjoy. 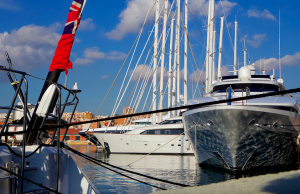 Thanks to investment from the east, this Western Mediterranean marina is now a safe haven for superyachts, sprinkled in Spanish sunshine – why not cruise in this summer?